If you are planning to give your kitchen a much-needed facelift, like changing the design, types of wood, lighting and coloring, it always helps have an expert opinion. With kitchen design trends changing frequently, it helps to know what is currently in fashion. The following are the hot trends in kitchen design this season. When it comes to the cabinets in your kitchen, there was a time when maple and cherry wood ruled. However, times have changed, and keeping with the current trends, you should now use oak, birch and bamboo kitchen cabinets. These woods have a lighter finish, which gives your kitchen a brighter look. Also, these are more eco-friendly and can do your bit for the natural environment. You can give your kitchen a completely new facelift if you decide to mix finishes. Yes! It’s completely unthinkable, but mixing steel appliances with granite tops and natural wood eating area can actually work wonders for your kitchen. This even saves you from changing the whole kitchen at once. You can pick one area and change it. This will give your kitchen a new look and be easy on your pocket as well. So go ahead and experiment. Gone are the days when white ceramic tiles would be the choice for backsplashes. Now you can use innovative materials and bold colours to create your kitchen backsplash. Use brick, granite, and quartz and even tempered glass to add a side of your personality to your kitchen. Kitchen remodeling should make a visible change in your kitchen’s look and it should make visitors go wow. Innovative use of backsplash would help you get this exact reaction. Do you want to be a part of the crowd or stand apart with your use of current trends and innovative kitchen designs? If you want to make a bold statement, change the whites in your kitchen’s backdrop. Use grays, canary yellow, burnt orange and honey to give your kitchen a bright change while keeping it warm and cozy. 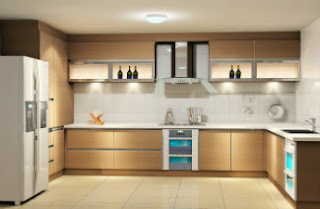 Your kitchen at home can become boring and monotonous if you stick to a particular colour scheme. The current trends asks you to jazz up your kitchen with the use of colours where you least expect them. Use colourful appliances and accessories in bright citrus hues to give a much indeed dose of brightness to your pale kitchen. You can also use wallpaper in interesting patterns and shapes. When it comes to lighting, LED is topping the charts. It is energy efficient and gives your kitchen a high-end finish. The dramatic use of LED in your cabinets and paneling can give certain sophistication to your kitchen. These interesting trends from competent experts, for designing your kitchen, is the best start to give your kitchen a completely new look. I have an idea to remodel my kitchen, so I think if I use cherry woods for cabinets it will make my kitchen beautiful.